You have to admire their resourcefulness. They see a problem, they put some thought to it, and they solve the problem. Very clever! I made cones like that for my bird feeder and the secret was mounting it loose at the top so it would just become vertical if the squirrel put their weight on it. Squirrels are fun to watch trying to figure out how to reach bird feeders, and they are often successful. AND he's wearing his black disguise so as not to be tracked down! Hee hee! It takes more than that to stop a squirrel! You have really squirrels in all colors. Never seen a black one before. So far my squirrel baffles work. Unfortunately, there is a tree right beside my feeder! I love them all, but they do make one's spend on birdseed go up. 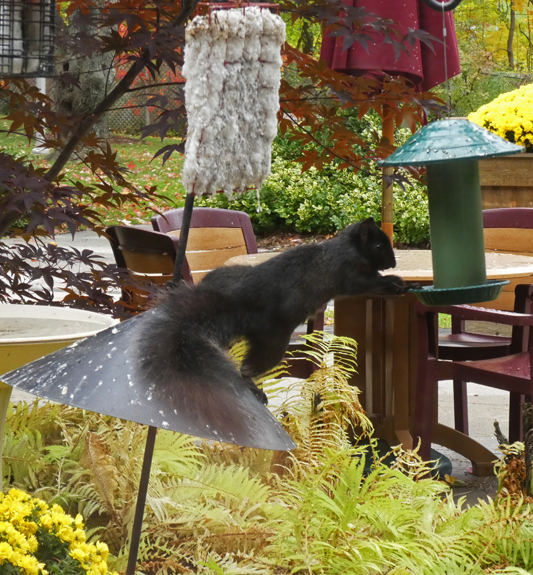 I have a battery operated feeder, that shakes the squirrels off, if they try to climb / perch on it. The birds love it. The squirrels timed the battery's depletion rate and while I was recharging the battery, chewed the cable that was holding the feeder on the Shepherd's hook, dropped it about 20' and gorged themselves on the tasty seeds. The feeder still works well, but has a dent in the lid. Happy Day to you, Pat! Very clever :) Had to laugh at this. By hook or crook they will fight to the end even if just for one peanut! LOL, nothing will stop a hungry squirrel. They always find a way. Still catching up with my commenting. Thanks for linking up and sharing your post. Have a happy day and week ahead.